that people see between the furnace and the dam. It’s big. It’s heavy. It’s rusty. And, unless you know that it’s a turbine, you might not recognize that it’s fundamentally the same technology as the gray machine displayed in the turbine house. Both are turbines. And both operated at Beckley Furnace at more or less the same times. While the turbine in the turbine shed powered the blowing tubs — the air compressors that provided the blast for Beckley Furnace — this turbine had a more mundane function: it powered a sawmill. Fair question: why might there be a sawmill at a blast furnace site? After all, sawing wood and making pig iron would seem to be pretty much unrelated functions, right? 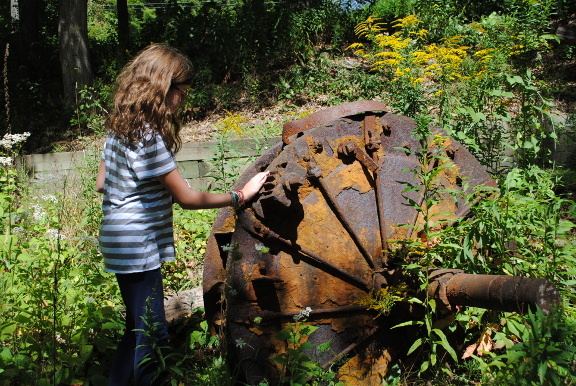 There was a sawmill here because there was an opportunity to use water power twice — first, to power the blast for the blast furnace, and then, before returning it to the Blackberry River, to run this turbine to power a sawmill. Wood needed to be sawed (or sawn, as they might have said a hundred years ago), and this was as good a place to do it as any. There was water power, there was a place to put the sawmill (between the blowing tubs and the stove that heated the blast), there were people around who knew about turbines. Wood was needed to build things — sheds, other structures — in the East Canaan works of Barnum and Richardson, or in greater East Canaan. Wood played an important but often overlooked role in the iron industry. Different kinds of wood were used for very specific purposes. For example, in close-up photos of the main turbine, you’ll see a ring of wood near the bottom end. This was a special wood, lignum vitae, imported from Africa,that was very strong and did not deteriorate in water. This ring of wood — and what you see in the turbine today is over 100 years old, most of that time spend immersed in mud — served as the main bearing for the generator. Another example would be the wood patterns used to create the molds in which railroad car wheels were cast at the Barnum Richardson Company works in Lime Rock. This was another highly specialized wood. We think it’s possible that this sawmill did very specialized sawing of unusual woods needed at various parts of Barnum and Richardson’s iron making and fabrication process. Why do YOU think there was a sawmill at Beckley Furnace? What plans to you have for this turbine? After all, it’s a shame to see it rust away! Currently under discussion are ways to conserve the Loeffel turbine, as well as ways to display it. Some of the ideas currently under consideration include building a second turbine shed (like the one upstream) but more or less where this turbine is located. Also we’re considering the possibility of displaying it recessed in the ground, so that people can see how it might have been positioned to operate. Visit the site and let us have your ideas — or send in your ideas on the form below! But we agree — we really don’t want to see it rust away!